“Love to Nippon 2018,” commemorating the seventh anniversary of the March 11, 2011 earthquake and tsunami that struck northeastern Japan, will be held on Sunday, March 11, at 12 p.m. at LAPD Headquarters, 100 W. First St. in Downtown Los Angeles. The disaster, known in Japan as Higashi Nihon Daishinsai (Great East Japan Earthquake), resulted in nearly 16,000 confirmed deaths, more than 2,500 missing, and more than 200,000 residents displaced, as well as meltdowns at the Fukushima Daiichi Nuclear Power Plant. The irei-sai (memorial service), co-hosted by Shussei Inari Shrine of America, will take place from 12 to 12:30 p.m., followed by a program indoors. Love to Nippon will also hold a candlelight prayer for the victims of the disaster on Saturday, March 10, at 9 p.m. on the north side of the Santa Monica Pier, 200 Santa Monica Pier A in Santa Monica. The earthquake struck at 2:46 p.m. on March 11 in Japan, or 9:46 p.m. on March 10 in Los Angeles. 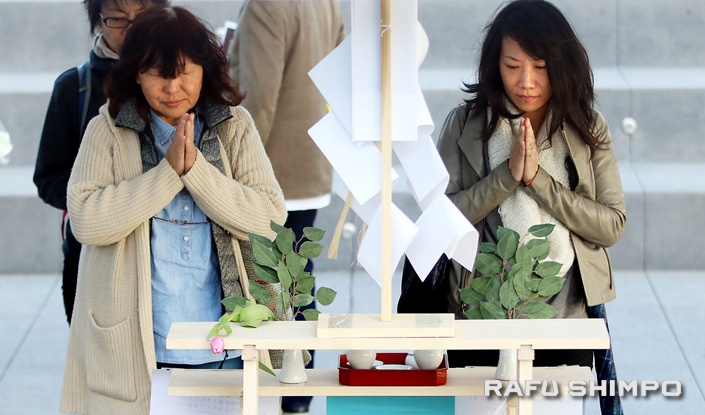 “Let’s send love and prayers from the people of Southern California to the people of Japan and to honor the lives lost, and the survivors and families forever affected by Japan’s worst natural disaster,” organizers said. For the past six years, the Love to Nippon Project has organized and presented the largest 3/11 memorial events held outside of Japan. Southern California is home to more Japanese citizens and Japanese Americans and has more ties to Japan than any other region in the U.S. Accordingly, those living in Southern California continue to support the survivors, many of whom are still in the process of recovery and rebuilding. Love to Nippon was founded in 2011 by Masako Unoura-Tanaka, a survivor of the tsunami who lives in Marina Del Rey a well as Ofunato City, Iwate Prefecture. Supporters include Nichi Bei Fujin Kai and Douglas Erber, president of the Japan America Society of Southern California. For more information, call (310) 484-1800, email [email protected] or visit www.facebook.com/LoveToNippon.